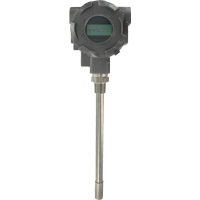 The Series TTE Explosion-Proof RTD Temperature Transmitter is the ideal product for hazardous temperature measurement applications. The TTE series has seven preprogrammed temperature ranges that are selectable via an internal dip switch. For those applications that need a custom range, the transmitter can be easily configured for any range between -30 to 250°F with a minimum span of 40°F. The span and zero can be quickly adjusted with a simple push button design. This unit has optional listings of FM for use in Class I, Division 1, Groups B, C and D, Class II, Division 1, Groups E, F and G and Class III atmospheres or ATEX (Directive 2014/34/EU) for II 2 G Ex db IIC T6...T4 Gb (-20°C = Ta = + 70°C), II 1 D Ex ta IIIC T111°C Da (-20°C = Ta = + 70°C) and IECEx for Ex db IIC T6...T4 Gb (-20°C = Ta = + 70°C), Ex ta IIIC T111°C Da (-20°C = Ta = + 70°C). The compact housing allows for the transmitter to be mounted in virtually any application. 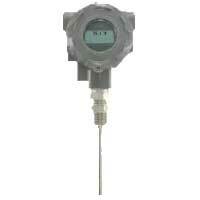 User selectable - any range between -30 to 250°F with a minimum span of 40°F. Ambient: -4 to 158°F (-20 to 70°C); Process: -30 to 250°F (-34.4 to 120°C). Transmitter: ±0.1% FS; Probe: ±0.3% FS. 1/2" male NPT or 1/2 male BSPT. 1/2" female NPT or M20. 2" to 18" (depending on model). 4 to 20 mA (two wire loop powered). 2 lines X 8 character LCD. Weatherproof and Explosion-proof. Listed with FM for Class I, Division 1, Groups B, C and D, and dust ignition-proof for Class II, Division 1, Groups E, F and G and Class III atmospheres. 2 lb 8 oz (1134 g).